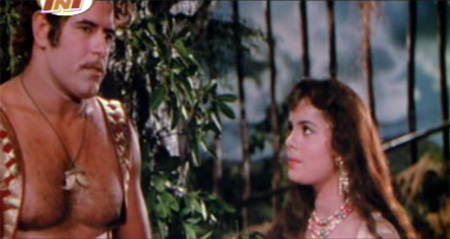 Sometimes all I really need is Dara Singh and one gorgeous song after another. 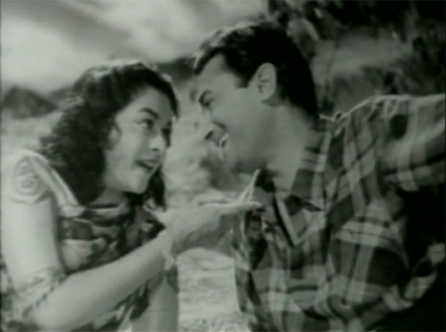 This film has that in spades, plus the lovely Ameeta and Bela Bose, and Kishore Kumar, and Sheikh Mukhtar, and King Kong (the wrestler, not the giant simian). What it doesn’t have is a coherent story or any sense of identity: is it a comedy? a spy caper? a wrestling film? a lost-and-found family drama? The answer, of course, is YES! to all of the above. 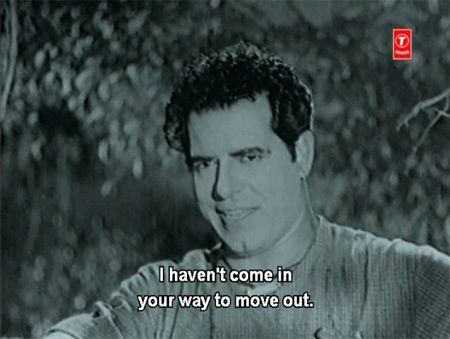 This is not necessarily a bad thing, especially given Dara Singh’s target audience (an audience in which I firmly belong). My main complaint is the comedy element, which quickly becomes tiresome. It is inserted awkwardly into what should have been dramatic or suspenseful moments, and goes on way too long in other places. No doubt this is the fault of director (and comedian) Maruti, but Kishore’s presence doesn’t help either. I love Kishore, but I prefer him a bit less manic than he is here. Maruti is credited with the “scenario” too, but no screenplay is mentioned and I am pretty sure there wasn’t one. The whole thing has a very seat-of-the-pants feel to it (some less charitable than I might even call it uncontrolled chaos). A man who lives in disguise, even at home with his mother! Another man who disguises himself to rob, steal and kill! Between them: a gorgeous but haughty woman whom they both want, one for love, one for money. Lurking on the sidelines: a weepy self-absorbed mother who makes every maternal blunder modern psychiatry could possibly dream up. This, my friends, is Munimji.